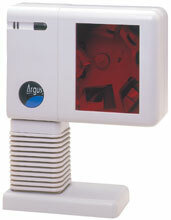 The Metrologic MS7220 ArgusSCAN has been discontinued. No direct replacement is available. The MS7220 ArgusSCAN is an aggressive omnidirectional laser barcode scanner ideal for retail, convenience, liquor, grocery, and specialty stores. Because it is engineered with a large, high speed scan area and a bright 650nm laser, MS7220 ArgusSCAN boasts exceptionally high first pass read accuracy for maximum productivity. Offering four stand configurations, the MS7220 ArgusSCAN is adaptable to a variety of applications. Keyboard wedge kit. Includes PS/2 cable, PS/2 to AT/XT adapter, low profile stand. RS-232 kit. Includes RS-232 cable, power supply & low profile stand. USB kit. Includes USB cable & low profile stand.